Children will make an easy and delicious, fun easter recipe. Melt butterscotch morsels in a medium microwave safe bowl. Add chow-mein noodles to melted morsels and mix. Shape mixture into a circle on wax paper. Use a large spoon to make an indention in the center of "nest." Let nests harden and then add jelly beans or chocolate eggs. 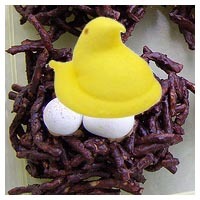 For a decorative touch, add a marsmallow peeps or chinelle chick to the nest.